Incredibly it is 20 years since John released his album And. In this article Mark Cooper reviews the album and briefly interviews John. 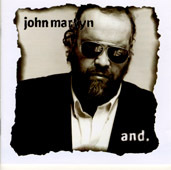 John Martyn, now label mate with Portishead, has been checking out the Chicago house scene, and revising his wardrobe. Mark Cooper salutes his return to eccentricity. Martyn’s debut for Go! Discs home of Paul Weller, Portishead and Gabrielle. One of the great maverick stylists of British music, John Martyn has been out on a limb in recent years, marooned first by some increasingly safe albums for Island in the mid ’80s and then by a deal with Permanent, who appeared to hide everything he recorded. Latterly, he seemed doomed to play out his middle age on an endless circuit of Britain’s town halls and arts centres, raging at his long suffering fans and churning out increasingly perfunctory readings of the likes of May You Never. Fortunately, Martyn’s finally been picked up by a label which fosters home grown talent, and promptly returned his best work in many a moon. Go! Discs seems an appropriate home for a man whose ’70s work anticipated the sparse, spacey funk of the trip hop genre by a mere two decades. Although he started out in the late ’60s folk scene, Martyn’s love affair with black music stretches beyond country blues and there’s traces of ska, dub, Coltrane, Stevie Wonder and hip hop all over And, with the sparse beat of the latter bringing Martyn’s profoundly individual style instantly up to date. Although Martyn’s renowned as a guitarist, precious little sounds like a guitar here as keyboards float and swoon, the beats drift in and out of the gorgeously languid opener, Sunshine’s Better, and Jerry Underwood’s sax dances around those slurred, blue eyed vocals. Martyn’s in gorgeous and untamed voice throughout, impossibly plaintive on Suzanne as Phil Collins echoes him on the chorus, kicking up a storm on the funky Step It Up. The fresh rhythmic approach also seems to have invigorated Martyn’s songwriting, which stretches for one of his most considered pieces in years, The Downward Pull Of Human Nature. All that prevents And from being an instant classic are a couple of insubstantial songs and a sense that, occasionally, he’s pulled back from the brink and employed his admittedly unique ’80s AOR style rather than go all the way with the new beats. Are you glad to be off Permanent and signed to Go! Discs? When did Phil Collins last play on one of your albums? Did you consciously draw on hip hop for this album? You’ve had your folkie phase and the suits period, what’s the vibe right now?